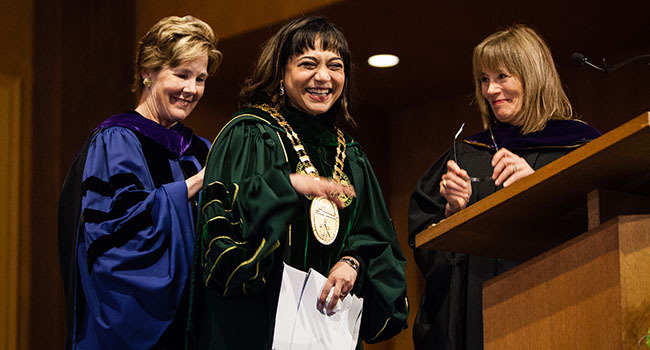 On February 24, Pareena G. Lawrence was installed as Hollins’ 12th president. 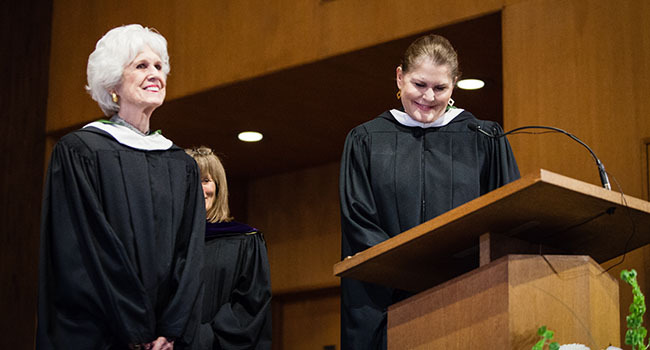 Linda Koch Lorimer ’74 (left) and Judy Lambeth ’73, chair, Board of Trustees, induct President Lawrence. I am privileged to present the descendants of our founder, Charles Lewis Cocke, who not only led Hollins with distinction, but was also a pioneer in women’s education and empowerment. 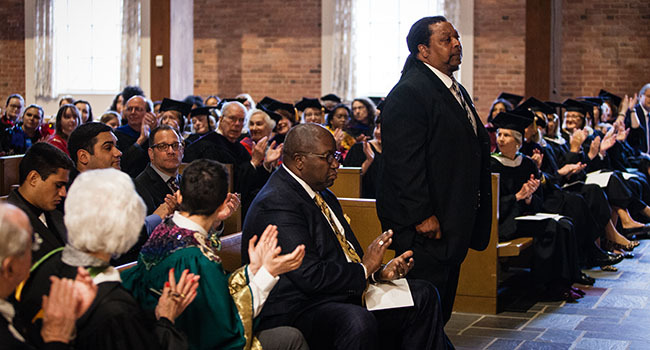 But we know that no single person was responsible for the establishment of this institution in 1842, and we want to salute and honor, in addition to the initial faculty, the mid-19th-century enslaved people and others whose labor ensured Hollins’ survival during its early years. We remain grateful to members of the Hollins Community, formerly known as the Oldfields Community. They, along with our founder, helped us become the institution we are today. Descendants of the Hollins Community families have joined us this morning so that we may honor their ancestors, and I ask them to please stand if able so that we may pay tribute to their contributions. You and your husband, James, have done more than anyone in recent years to enhance the arts and sciences here. Your extraordinary generosity in support of such initiatives as the restoration of the Hollins Theatre physical space, growing the theatre and playwriting programs, and renovating the Dana Science Building, which was rededicated yesterday, is nothing short of transformational. 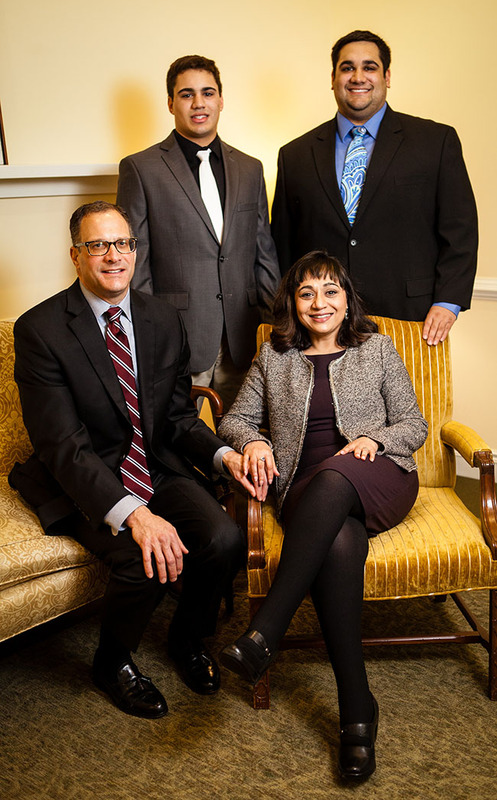 Hollins has also benefited from your insight over the past decade as a member of our Board of Trustees, where you exhibit that rare and wonderful capacity to ask the right questions at the right time. Today, Libby McDonnell, in recognition of your achievements, Hollins University is privileged to bestow upon you the degree of Doctor of Laws honoris causa. President Lawrence can be found not just working in the Cocke Memorial Building, but also taking her First Step with the seniors, joyfully summiting Tinker Mountain, attending Roundtable meetings, playing board games in Tinker, and running with the cross-country team. 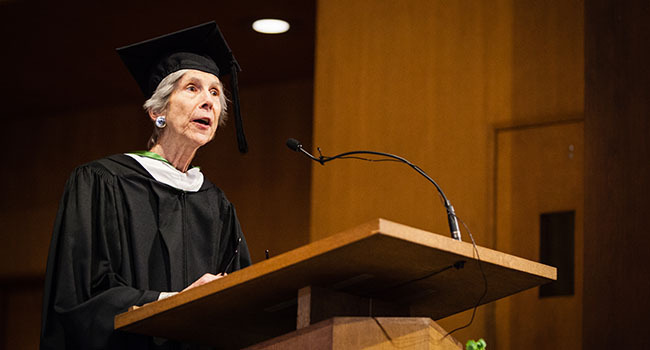 She is admired by students, not just for her efforts to truly connect with us, but also for her strong dedication to preserving the spirit and mission of Hollins while pushing us to grow in new and positive directions. She has gotten to know the Hollins that we are and that we have been, but has also not been afraid to share her vision of what we need to do to meet the challenges ahead. 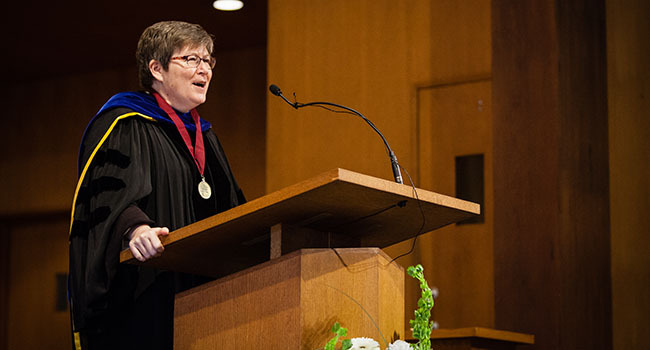 She understands the value and work of faculty, and she is funny, warm, and authentic. I am also a proud descendent of the enslaved people who at one time labored on this campus and helped this institution of higher learning prosper. 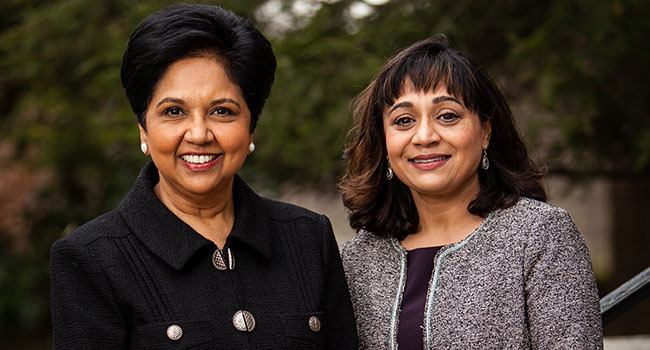 So I am privileged to join you today to represent the staff as we celebrate an exciting new chapter in our history with the inauguration of Pareena Lawrence as our 12th president. I am honored today to offer to our 12th president a grand total of 19,307 inaugural congratulations. That is the number on record in our alumnae office of attendees, graduates, and graduate students on whose behalf I speak. When I became CEO of PepsiCo more than 11 years ago, I was convinced that PepsiCo—or any company hoping to succeed in the 21st century—needed a mission where we not only served our shareholders, but dedicated ourselves to the larger purpose of serving our communities, our employees, and our societies. Your purpose has always been clear and steady: You are devoted to the elevation of the liberal arts and the education of women. This is a place where women are the singular focus of attention, in the classroom, on the field, in the lab, and at the highest levels of administration. Virginia Woolf was partially right when she wrote that a woman needs a room of her own; what Hollins has shown is that women deserve a campus of their own. But what about performance? 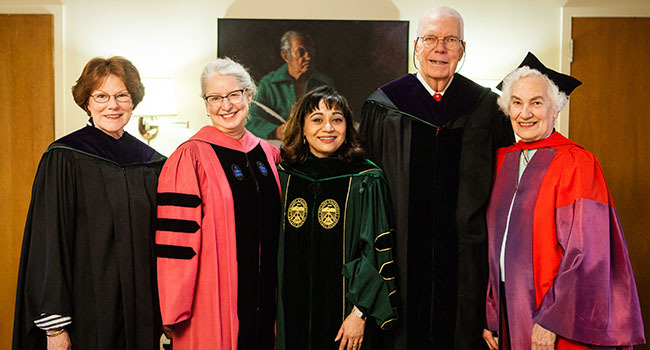 My advice to those who love and lead Hollins is to think carefully and ambitiously about the performance you deliver, and how it can be even better. Because if there is anything I have learned in my years at the helm of a large global enterprise, it is that innovation is essential—that even the most outstanding institutions cannot afford to rest on their laurels, particularly at a time when a wave of megatrends is reshaping our world, from digital innovation to the rise of millennials. No matter what position in life you reach, when your child yells in the morning, “Mom, I can’t find my socks! What did you do with them?” you go sock hunting. Before anyone can leave the house that morning, no matter what major speech you must give or important decision you must make, everyone needs socks on their feet—and somehow, that small detail grounds you in what really matters and re-centers you in this universe. As you know, I am an economist by training, but I am a university president by choice. Those of us who engage in the discipline of economics today are often more comfortable with equations, statistics, and numbers than we are with words. Modern economists do not typically concern themselves with metaphysical matters, the questions of spirit and soul. We’ve long thought that what really mattered was to quantify information and create economic models that would promote tangible economic growth and development, nationally and globally. But in many ways, we were and are shortsighted. Shortsighted because we overlooked the fact that every number, every demand curve, every statistical report on “intensive margins” is nothing but an abstraction, a mere reflection of human life and of the infinite series of decisions we make that constitute our numbered trips around the sun. We were late to the realization that we don’t move the demand curve by moving the supply curve. We move the demand curve by moving the hearts and minds, the dreams and aspirations, of the people around us. Don’t get me wrong. I firmly believe that the discipline of economics is essential in understanding the world and how it operates, but it cannot address several of the world’s most pressing questions and their immeasurable answers. We are more than the sum of our parts. Thankfully, Hollins and other institutions of higher learning grounded in the rich traditions of the liberal arts have never lost sight of what is truly important. Ever since I was a young girl, I have always wanted to change the world. 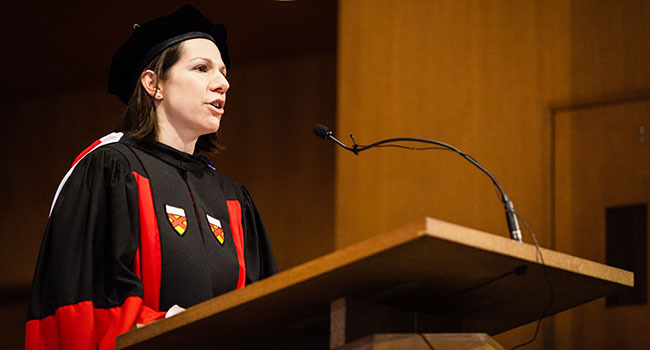 It was indeed fortuitous when years later, I accepted a faculty position, which in my mind was only a temporary stop for me—but it turned out to be my calling. Just a few months into my new role, I quickly realized that preparing the next generation of leaders and change-makers, who will go on and leave their own mark on this world, has much more impact in magnitude than taking on this work of change on my own. This is what we economists call the multiplier effect—the power we have as educators. Indeed, I am so grateful to devote my life to education—preparing students to lead lives of consequence and change the world within their sphere of influence. At Hollins, as 176 years of our forebears have shown, we will continue to reject choosing lives of quiet desperation—not because it is easy, but because we know no other way. We are called to a different sort of life, a life of noisy exuberance, a life of joy and hope, and life worth celebrating not because of our financial riches but because we are making a positive difference. A difference in our own lives. A difference in the lives of those we’ve touched in our lifetime. And a difference in the lives of the thousands of students yet to come to Hollins whose lives will be enriched and strengthened by the choices we make right here. 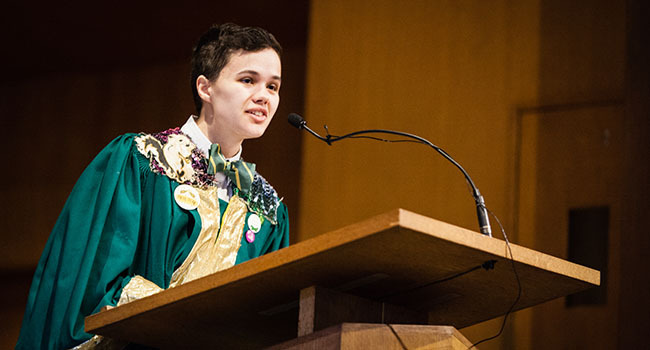 I want you to join me to build the Hollins of tomorrow so that we can continue the noble purpose of educating women who lead lives of consequence. By what Hollins can do … and must do …and will do. Today. Tomorrow. Together. 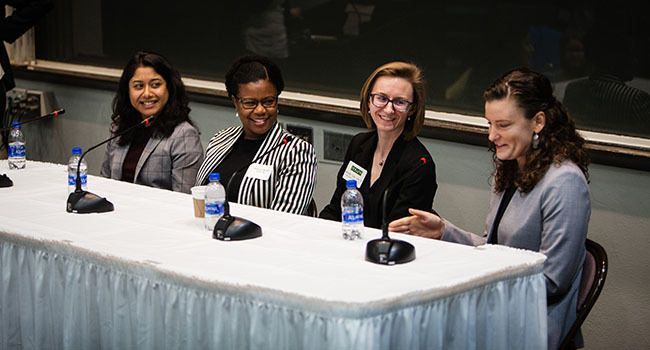 Alumnae panel members: Puja Sharma ’11, postdoctoral research fellow, Wake Forest Baptist H,ealth; Shamecca Q. Bryant Jones ’04, head of U.S. operations, Carolina for Kibera, Inc.; Meredith Cope-Levy ’12, M.F.A. ’18, playwright and event coordinator for Hollins; and Elysse Stolpe ’10, assistant commonwealth’s attorney for Waynesboro, Va.